Pedal osteitis is a common condition in the horse, resulting in ongoing foot pain and lameness, which can be extremely limiting to athletic performance. The end result for many horse owners is rest, specific shoeing strategies, medications, and in some cases surgery is warranted. Despite these treatment options, many horses do improve in their soundness, while others continue to struggle. If you dig into the problem on a deeper level, better options for management become available. Whether if you refer to the third phalanx in the horse as the coffin bone or the pedal bone, it doesn’t matter, as they are different terms for the same bone. The coffin bone is analogous to the last bone in your middle finger that contains the finger nail. This would represent the coffin bone, or third phalanx, of the horse, encased within the hoof capsule. Pedal osteitis simply implies inflammation of the coffin or pedal bone, which can arise due to many causes. This is a condition that is most often diagnosed via radiographs or x-rays, noting in the films that there is bone remodeling, bone loss or lysis, along the peripheral edge of the coffin or pedal bone in the horse as a result of ongoing inflammation in that region. The coffin or pedal bone resides within the hoof capsule and is the first bone in line regarding weight bearing and stress distribution in the horse. The normal coffin bone has a rounded shape coming to a point or apex in the toe region, with wings or collateral cartilages on either side in the heel region. 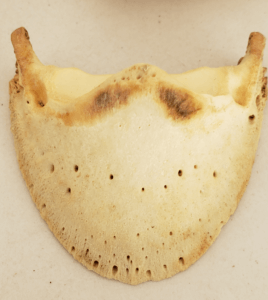 The coffin bone is dense in the central region, but it thins out towards the peripheral edges and the bottom of the bone is concave, rather than flat. There are also numerous holes or vascular channels noted within the bone, which are areas where blood vessels circulate. If we then turn the above image so the toe region is evident, you can then start to appreciate the peripheral bone that comes into contact with the ground surface. In the normal coffin or pedal bone in the horse, you can see that the peripheral rim or edge is rather smooth (Image 1). 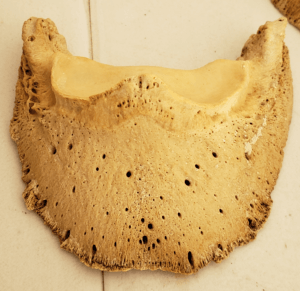 In the horse with pedal osteitis or inflammation of the coffin bone, this peripheral edge is jagged, broken down, and thinner in nature due to bone loss or lysis (Image 2). This bone loss is notable in radiographs when the coffin bone is assessed. This can be seen as an increased black filling or lack of density to the peripheral edge of the coffin bone, which indicates bone loss. You can also appreciate a more jagged or roughened appearance to the peripheral pedal or coffin bone edge (Image 3). As with many health conditions in the horse, in order to provide a more complete therapy option, you must address factors that are involved with the condition creation. Pedal osteitis in the horse is a degenerative condition, not too far removed in physiology from arthritis in a joint. Although the condition is degenerative, it can be improved and in some cases, the bone loss can be restored or at least improved. Pedal osteitis is bone inflammation as a result of increased stress placed upon the coffin or pedal bone. In most cases, the pedal bone is taking on additional stresses due to a thin sole. 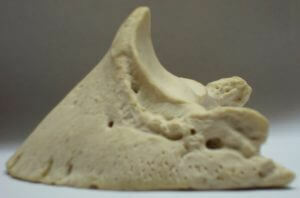 The sole is ideally a minimum of 10 mm thick in all areas and provides protection to the fragile coffin or pedal bone. When the sole is thin, the pedal bone is not protected, and thus takes on additional forces which add to the inflammation. In other cases, the normal 5-8 degree palmar angle or slant to the coffin bone is not present due to shoeing methods or an under-run heel. Here again, if the palmar angle is zero or negative, the coffin bone will take on additional stress. A final factor is often toe-first landing, which is a result of improper shoeing or too far forward heel placement. This toe-first landing leads to chronic toe stress, which then creates the inflammatory process and bone degeneration. All of these ‘foot’ factors strongly contribute to pedal osteitis and in the early stages, it starts off as bone bruising and pain upon walking on hard surfaces. If the condition is not managed properly, the inflammation continues and the condition progresses, resulting in bone changes and remodeling on radiograph or x-ray. If you have a horse with pedal osteitis and truly want to recover and improve the situation, here are the factors that must be addressed. You can cover up and improve pedal osteitis conditions in the short-term with special shoes, pads, pour-in cushions, or medications. These remedies may help to improve the ‘shock’ or stress to the bone, but they rarely truly resolve the condition. Only until you address the factors that created it, can you truly resolve and improve the condition. Pedal osteitis is a very common condition in the horse and often either goes unrecognized or improperly managed. Most horses suffering this condition are plagued with ongoing hoof and sole pain on various levels, which not only impairs their performance, but strongly contributes to ongoing stress in that animal. With the right approach, these cases can be improved in a matter of months, without special expensive shoes or medications. These horses are then not only sounder, but are generally healthier and perform better than prior. 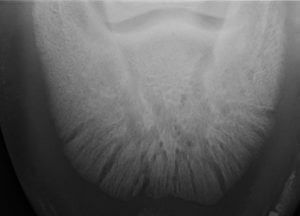 The prior radiograph (Image 3) was from a young Thoroughbred gelding suffering from chronic pedal osteitis. 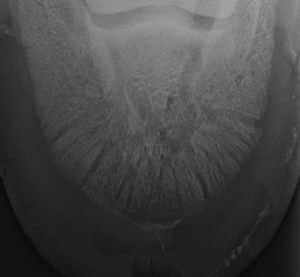 In a matter of 4 months, not only is this horse dramatically improved soundness wise, but on repeat radiograph, you can appreciate the increased bone density and smoother peripheral border (Image 4). This was achieved through barefoot trimming, proper balance, a high level of whole-food nutrition, herbal support, and topical therapies. Pedal osteitis or inflammation of the coffin bone is very common, but it shouldn’t equate to a life-time sentence of ongoing pain for your horse. Recovery is possible with the right approach and true dedication.